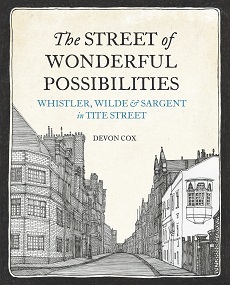 Devon Cox’s book, The Street of Wonderful Possibilities focuses on Tite Street in Chelsea which became one of the most influential artistic quarters in the late nineteenth and early twentieth centuries. Famous residents including James Abbott McNeill Whistler, Oscar Wilde and John Singer Sargent helped to forge the street’s reputation for a sanctuary for those who followed a bohemian lifestyle. Even before Tite Street had been created, Chelsea had developed a reputation as a haven for writers and artists. In the 1830s, Thomas Carlyle became the ‘Sage of Chelsea’ and in the 1840s, the mysterious ‘Mr Booth’ who lived in a small Chelsea cottage was none other than J.M.W Turner. The 1860s saw Dante Gabriel Rossetti after the death of his wife relocate to Cheyne Walk on the Chelsea riverfront with poet Algernon Swinburne. It was also at this time American artist James Abbott McNeill Whistler began his long association with the area. Both Rossetti and Whistler developed their own social gatherings and led to the idea that the area was becoming more bohemian. However, by the 1870s, the bohemian clique was beginning to relocate and even Whistler left Chelsea. It was not only residents that were changing, Chelsea had been a small village in the first part of the 19th century but by the 1860s and 1870s it had become a part of the expanding metropolis. It was part of this development that led to the creation of Tite Street. The whole Chelsea riverfront was developed with a new embankment and Tite Street was developed to create a link between the Royal Hospital Road and the new embankment. Whistler was looking for custom-built house with a studio and employed his friend and architect E. W. Godwin to create his dream house in Tite Street. For Godwin it was to be a more difficult task than he considered with Whistler often battling with the Metropolitan board of works over the finer details of the house. Eventually The White House was completed in 1878 and become the first of an artist colony in Tite street, others followed including the young aristocrat artist Archibald Stuart Wortley, Carlo ‘Ape’ Pellegrini, Frank Miles and a certain Oscar Wilde. Whistler fresh from his success against the Board of Works began an ill-advised case against the respected critic John Ruskin. This case bought Tite Street into the public domain and although Whistler won his case, it was a hollow victory, he was given only a farthing damages. The building of the White House and the court costs had financially ruined Whistler and he was declared bankrupt in 1879. Although he had lost everything, it proved only a temporary setback for the American who returned to Tite Street after a time in Venice and rented a studio at number 33. To improve his financial position, Whistler resolved to paint ‘ all the fashionables ‘. This was the beginning of the golden age of Tite Street, the Prince of Wales and Lillie Langtry were amongst the first to visit Whistler’s new studio and soon the street was full of the carriages of the wealthy. It was not just the sitters, Whistler became a hero to a younger generation of painters who flocked to his studio, Mortimer Menpes and Walter Sickert were just two of his ‘pupils’. It was not just Whistler whose star was rising , Oscar Wilde was making his reputation with his plays, books and wit. The book documents this period in detail, it was a time when the two ‘Titans’ dominated an area that had become the most important artistic enclave in London, but for all the success, there were clouds on the horizon which would envelope Tite Street. The rise of fall of Oscar Wilde is well documented, however the photograph in the book of Whistler’s coffin being carried through a sparsely populated street is an indication that at the end, the artist’s ability to make enemies had surpassed his ability to make friends. By 1903, two of the greatest ‘Titans’ of Tite Street had died and a number of the supporting cast had bought the curtain down on their careers. It was left to the more stable and popular Sargent to carry the flag for the bohemian enclave. Following his illustrious compatriot Whistler, he began to paint the ‘fashionables’ and acquired considerable wealth. When he died in 1925, the golden age of the street was over, other artists took on the baton but none reached the dizzy heights of Whistler, Wilde and Sargent. Augustus John bought some elements of bohemia but when he left in 1950, the world and the street had changed beyond all recognition from its glory days. Although on the surface, the story of a street would not set the pulse racing, but this was no ordinary street. The author has bought together many of the interactions between the residents that often get lost in single biographies. Oscar Wilde watching Ellen Terry coming away from a Sargent sitting, costumed as Lady Macbeth and writing Tite Street “must always be full of wonderful possibilities” is a fine example of how the residents interaction provided inspiration for their work. This is a fascinating, entertaining, well researched book with a number of illustrations which highlight some of the incredible pieces of art and writing produced behind the brick facades of Tite Street. Although the three ‘Titans’ dominate the book, the author acknowledges the parts played by a large supporting cast that included other artists, writers, models, mistresses, lovers, sitters, residents, pupils and critics. He also gives a voice to some of the women of Tite Street who tried to challenge the male dominated society, such as painter Anna Lea Merritt and the Welsh sculptor Edith Elizabeth Downing, who supported the suffragettes cause. By londonvisitors2014 in London Book Review - Non Fiction on July 8, 2015 .